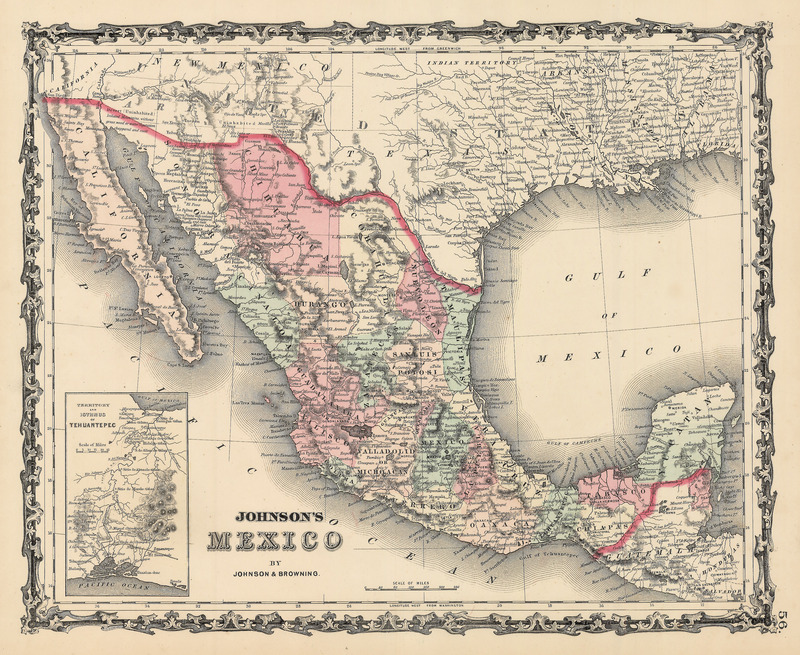 1862 Johnson's Mexico - the Vintage Map Shop, Inc.
the Vintage Map Shop, Inc. This is a reproduction print of an original antique map of Mexico. It was originally published in 1862 by Alvin J. Johnson in New York.This map of Mexico is brightly color coded according to its states. It includes an insert of the Isthmus of Tehuantepec. Within the Unites States, the map depicts New Mexico north of Arizona, and provides extensive detail with regard to river systems and towns within Texas and Indian Territory. © 2019 the Vintage Map Shop, Inc..
- The product listed is a high resolution, printed reproduction of the original map. - The prints are of giclée quality. They are made using a twelve ink, color printer on acid-free, archival paper. Colors are guaranteed to last without fading for over 100 years. - The available size options are aimed to fit standard size frames. This will not apply for all maps and sizing options. - The dimensions give are approximate and may vary by up to .5 inches. - All of our maps will include an extra margin of 1 - 2 inches for matting purposes. - Our paper is referred to as a Premium Archival Matte (230 gsm). This heavyweight paper is smooth to the touch, neutral-white, acid-free for a longer print life and features an instant-dry coating that resists fingerprints and smudging.